The saying goes that a picture is worth a thousand words. That is definitely true for the first image featuring Queen Elizabeth II and pop music sensation Lady Gaga. Many words are needed in order to explain its veiled meaning but I will try to keep it under a thousand. I would venture to say that upon looking at this picture many people would not be able to recognize both women (either one or the other but not both). That in of itself may well be to keep the real meaning hidden. The woman on the left has been the British Monarch for the last 59 years. The woman on the right is currently one of the top pop music singers in the United States and Europe. You could say she is the remake of Madonna in the 21st century. Chances are your local elementary school is playing her songs at your 7th graders dances. So what does one see now that we know the identities of who we are looking at? Not much, if anything to the casual observer. However, what about Satanic symbolism? For starters we have the Queen dressed completely in black and Lady Gaga dressed completely in red. In this linked picture you see Lady Gaga in both colors. Not exactly a wholesome image to be sure. In fact the colours red and black are the two most prominent colours used in Satanism. This can be seen in the image I found on a website called satanshop.com (right). 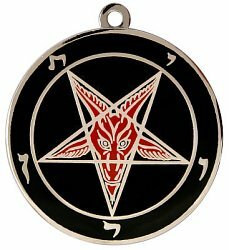 It is a pendant featuring the head of the devil inside a pentagram in red on a black background. There is also a church of Satan headquartered in San Francisco, California. You can also find them on internet (churchofsatan.org). The image on the left is the logo of the Bohemian Club (black owl and red letters) also located in San Francisco, Ca. The Bohemian Club is an elite group of politicians, bankers etc. that perform Satanic rituals at a place known as Bohemian Grove in Monte Rio, California. Inviting pop stars to the Royal Palace is nothing new to the Queen. In fact, she has gone as far as bestowing knighthood to the likes of Mick Jagger. Jagger is the lead singer of the Rolling Stones who put out an album in 1967 called “Their Satanic Majesties Request”. They also have hit songs such as Sympathy for the Devil and Dancing with Mr. “D”. In addition, Jagger is a member of the OTO (Ordo Templi Orientis). 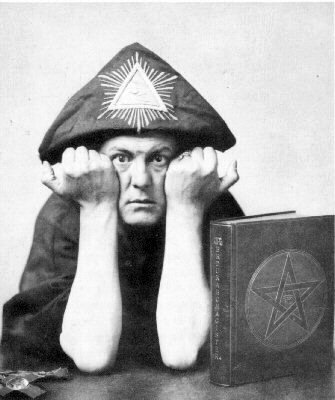 This is a freemasonic occult organization that was once headed by the self proclaimed “most evil man alive” and “the beast” Aleister Crowley (right). The queen is also the supreme governor of the Anglican church in Great Britain by the way. This means that she formally appoints its high-ranking clergy and naturally this gives her some say in who is finally chosen. All of which may help explain why so many, particularly in Africa, are turning away from the Anglican Church over its stance on homosexuality. It’s almost as if the church was being undermined from within but that shouldn’t be a surprise given who appoints prominent clergy. The Queen’s list of pernicious guests over the last five decades is quite substantial but hopefully you get the picture (pun intended). So we now see that Satanism is no way at all confined to bizarre looking people covered with tattoos and body piercings. Yes, there are Wall Street Executives going to work everyday in a $5000 dollars suit and tie that worship the devil. Think of it as a caste system ranging from the richest most powerful people in the world all the way down to a minimum wage dishwasher working in Greenwich Village, New York. For the ultra elite Satanism is generational. So whether the next British king is the queen’s son (Charles) or grandson (William) the House of Windsor along with the Rothschild family will continue on with its demonic destruction of not only Great Britain and the United States but the rest of the world. 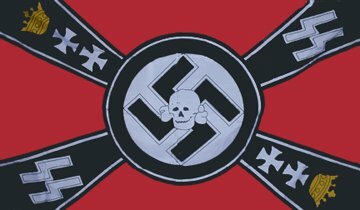 Finally, this website feels it necessary to point out that the same contrasting colours appear repeatedly in Nazi insignia (below). Indeed the same juxaposition of colours appears in Klu Klux Klan insignia (founded by the infamous Albert Pike) and we think that this is more than a coincidence. Ed. at posed by Iran that later turn out to be totally groundless.